Our pressure pots, reservoirs and pail pumps are ideal for dispensing adhesives, coatings and other liquids. Suitable for dispensing bulk materials. The Fisnar CR300 Cartridge Retainer provides stability for 310ml cartridges when dispensing sealants, silicones, adhesives, liquids and pastes under pressure. It can be handheld, stand-mounted, or mounted to a robot. A clear pressure pot reservoir for dispensing low viscosity liquids directly from bottles and up to 500g jars. Regulated air pressure forces the liquid in the bottle up through a disposable tube to a connector, which can be interfaced to a valve or dispensing pen. The IJF PP300-GL-A is useful for control of hazardous materials, such as solvents and cyanoacrylate adhesives (CAs or “superglues”). IDM Pressure Pots are reservoirs used for dispensing adhesives, coatings and other liquids. Typically, the liquid (in its normal container or bottle) is placed inside the pressure pot, a dip tube is introduced into the liquid, and the system is closed and pressurised. The liquid is forced by the pressure out of the reservoir to a dispensing valve or other applicator. The FIS DA35 Small Pail Pump, is a bulk material feed system suitable for silicones, pastes and greases. 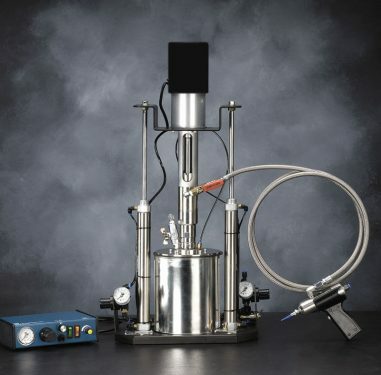 This dispensing pump extrudes medium to high viscosity material under pressure directly from a pre-filled pail or can in quantities of 1kg (1 quart) or 3kg (1 gallon).